The Custard TV: Netflix has another winner with Unbreakable Kimmy Schmidt. 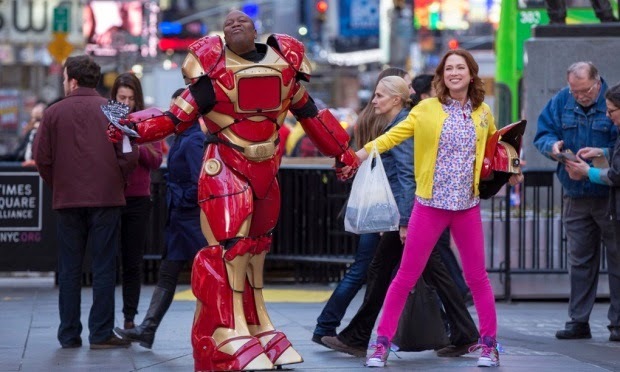 Netflix has another winner with Unbreakable Kimmy Schmidt. I never thought I'd become one of these people sat with their 'smart' TV complaining that Netflix was getting an age to load. I've always bemoaned those people. My nostrils would flare at the mere mention of a streaming service, "that's not real TV" I'd mutter. Lately though, I found myself slowly morphing into one of 'those' people. I reveled in the glory of Breaking Bad, discovered an appreciation, and equally quick disinterest in Homeland and gorged myself on Community and The Good Wife. It bemuses me! I became one of 'those' people during the sport filled summer of 2014 and even though TV has vastly improved I still enjoy the convenience of streaming something on TV. Lately. Netflix has kept me interested with their original series. Breaking Bad spin-off Better Call Saul, which is only exclusive here but airs in the US on the AMC network, and more recently their new comedy Unbreakable Kimmy Schmidt. This warm single camera comedy comes from the minds behind NBC's hit 30 Rock Tina Fey and Robert Carlock. The first thing that struck me here was why on Earth NBC hadn't snapped Fey and Carlock's hands off when rumours of this show started to circulate. Admittedly the premise might be a bit hard to swallow initially but, it's in such good hands that you instantly warm to it. The lovely Ellie Kemper plays The Unbreakable Kimmy Schmidt of the title. Despite a traumatic past which the show teases in nicely placed little nuggets throughout each episode Kimmy is a glass half full, happy go lucky person, desperate to please and make her way in the world. Kimmy is one of the four “Indiana mole women,” who were convinced by a fire-and-brimstone cult leader that an apocalypse had razed the earth and the shelter was the only inhabitable place left. The women head to New York City as part of the obligatory media gauntlet, and Kimmy decides to stay there, choosing to shed her past in the city’s anonymizing bustle rather than let her involvement in a news oddity define her life. Her time in the underground bunker means life in 2015 is utterly alien, and the show plays on her discovery of cameras on phones, cultural references and fashion. She's basically a character frozen in time since she joined the cult. I appreciated that the opening episode didn't spend too much time 'underground' choosing instead to focus on Kimmy's journey into the world outside. She's a lead character who attacks everything with such a sense of adventure that's impossible not to get swept along in her sense of wonder. It was pedigree of Fey and Carlock that initially caused me to hit the play button and fans of 30 Rock will enjoy this. It's positive outlook and even the music feels reassuringly familiar to those of us who spent time at 30 Rockefeller Plaza. Fey and Carlock co-wrote the opening episode which featured local news report which featured the caption “White Women Found.” Underneath, in a far smaller font: “Hispanic woman also found.” In a way the New York here isn't any different to the world Liz Lemon and her colleagues inhabited in 30 Rock but Kimmy Schmidt feels a warmer and optimistic story. There are darker moments, not matter how hard she tries to look at her new world with rose-tinted glasses her time in the bunker never leaves her. Time will tell if she's able to keep her past secret from her employer but the time is bunker is never far from her mind. The only downside to this new form of 'bingewatching' is that I could happily gorge on all 13 episodes now available on Netflix and it'd be over before I knew it. I urge to give it a go though as Netflix have wisely already granted a second series which is great news, don't only because I think it shows a wealth of potential but also because the theme tune is brilliantly catchy! Unbreakable Kimmy Schmidt is now available on Netflix.